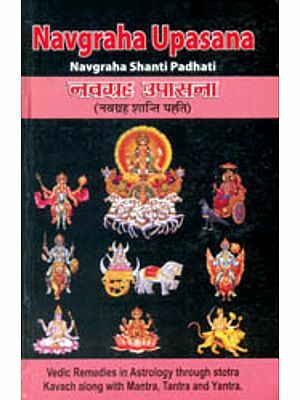 Navagraha Purana chronicles in fascinating detail the birth, life and glory of the Nine Planets, the Powerful astral deities who are the ultimate arbiters of man’s destiny. This compelling narrative paints a delightfully inmate portrait of the Navagrahas. 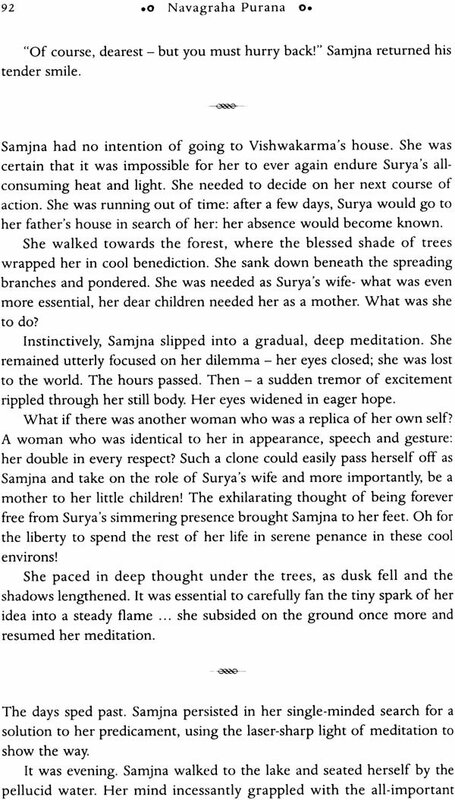 Surya subdues his raging heat to please his beloved Samjna. 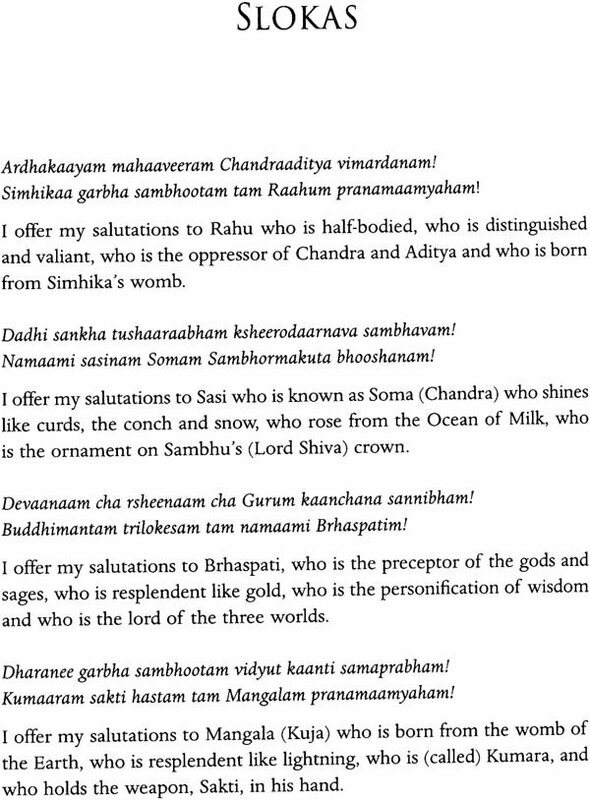 Chandra lusts after his Guru’s wife and is cursed to wane each month. 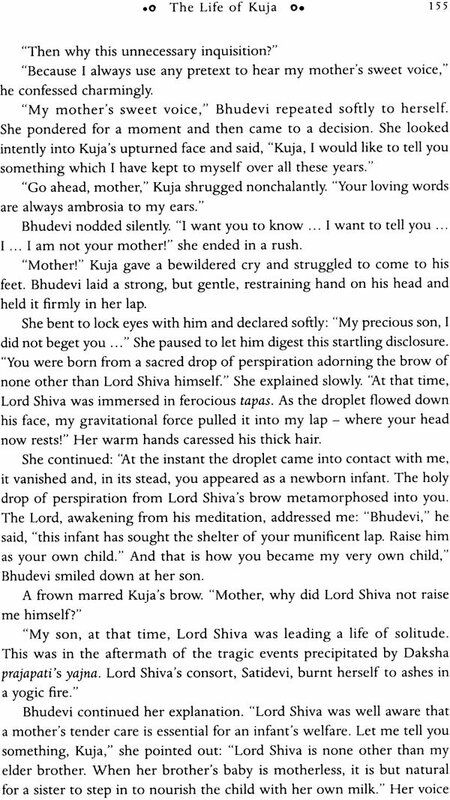 Kuja emerges from a drop of perspiration on Shiva’s brow. Budha marries lla, Who is his wife for one month and a prince in the next. Brahaspati forgives his wife’s adultery and curses an amorous apsara to be born as a monkey. Usana becomw Sukra when he is swallowed by a furious Shiva. 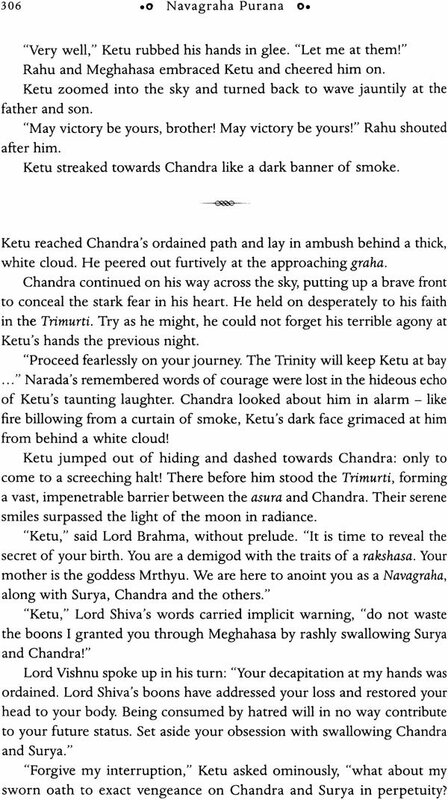 Sanaischara requests the Trimurti to ensure he inspire fear in all living beings. 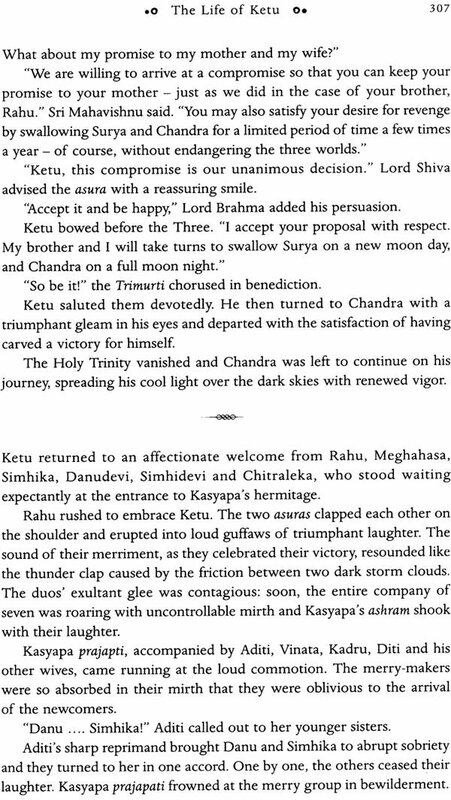 Rahu and ketu wreak their vengeance on Surya and Chandra by Swallowing them. 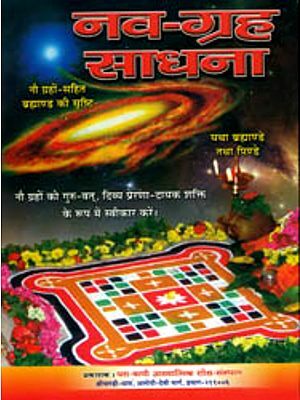 In and irresistible medley of drama, romance, humour and devotion, Navagraha Purana entertains and informs as it asserts that no one is exempt from the implacable influence of the Nine Planets. V S Rao (Vakkantham Suryanarayana Rao) is a celebrated Telugu author, playwright and script writer. He was born in 1942 at Arikela, a remote village near Punganuru in Andhra Pradesh and has a high school education. He wrote his first story, which was for children while still a child himself. His father Mr. Varadaiah, who was a lover of literature recognized his son's incipient talent and encouraged him to read extensively, Mr. Rao thus went on to become a voracious reader and writer par excellence. Later Mr. Temporau, the pioneer of Telugu pocket detective fiction, became his mentor. Mr. Rao's works include short stories, novels, plays and philosophical articles. Mr. Rao has a number of titles to his credit under the nom de plume V S Rao, Baatasaari, Koundinya, Suryaatreya and Chitrabhanu. While working s translator in one of the wings of Tirumala Tirupati Devasthanams, he has translated a number of Kannada religious books into Telugu. His extensive epic-based works include Navagraha Puranam which has sold more than one lakh copies. His plays explore societal issues and mythology, while his books run the gamut from philosophy and social concerns to thrillers and drama. His writing is largely women-centric, and passionately highlights women's issues. Mr. Rao is the recipient of numerous literary awards for his plays and prizes for novels. His short story MODEL was anthologized in the Bharateeya anapith's Visishta Bhaarateeya Kahaniyan and his literary work has been the thesis of a doctorate awarded by Sri Venkateswara University. Mr. Rao is the father of three sons including Vakkantham Vamsi, a reputed Telugu screen writer. He lives in Hyderabad with his family. The Ganges, most sacred of India's rivers, flowed sedately past the ghats of Varanasi, paying homage at the feet of Lord Shiva as Vishwanath. These were the waters which had witnessed the passage of Rama, Krishna, Buddha and other epic heroes and immortals, on earth. What secrets and ancient memories must the mighty river guard in its depths! The evening sun shone forth in all its glory and painted the wind- rippled water in myriad sparkling hues of copper and gold. Tamorim sarva paapaghnam pranatosmi divaakaram." I offer my salutations to Divaakara (Surya), who shines like the japa flower, who is the son of Kasyapa, who is resplendent, who is the enemy of darkness, and who is the destroyer of all sins. Prayer completed, Nirvikalpananda exclaimed in delight. "The sun seems to have grown in splendor after the eclipse!" Chidananda smiled and said. "Naturally, master. His relief at having escaped total oblivion is obviously shining through!" This evoked merry laughter from his friends. 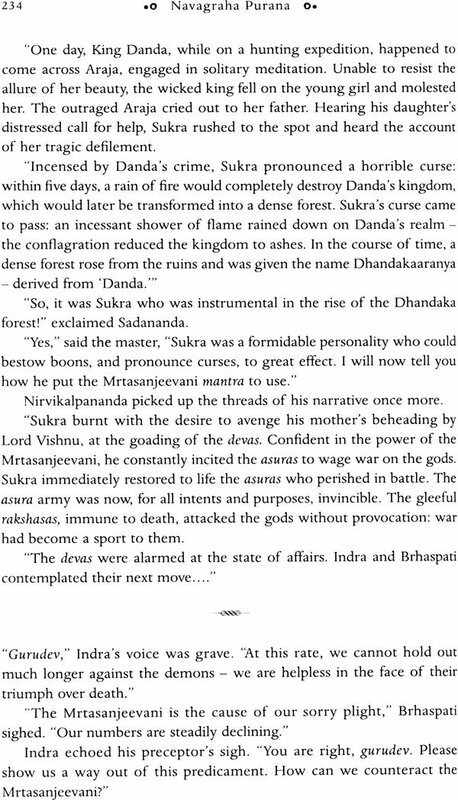 Then, Sadananda turned respectfully to their guru. "Master, the eclipse has kindled in me a desire to hear the story of the splendid sun." 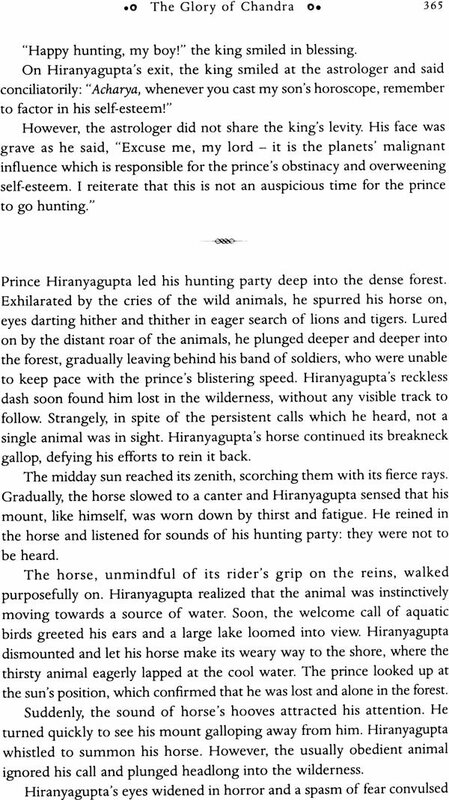 His request was seconded by Shivananda, who added, "Why stop with only the king of the planets? 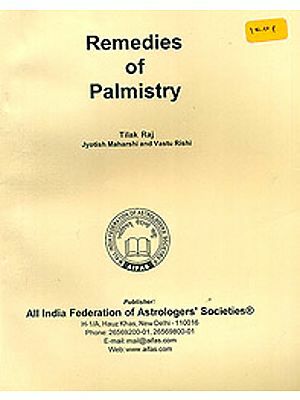 Master, bless us with a discourse on the origins and history of all the nine planets." Vimalananda quietly pleaded, "Master, we long to immerse ourselves in the bottomless ocean of your wisdom. Enlighten us." Gazing at his disciples with thoughtful eyes, Nirvikalpananda said, "It is only right that you learn the history of the Nine Planets. 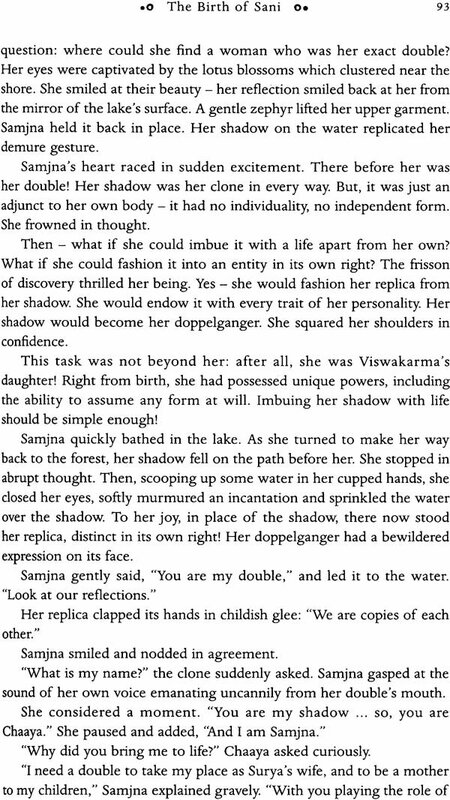 And Shivananda has a point: the stories of the Navagrahas are so intimately woven together that they can only be appreciated as a unified whole." With a serene smile, Nirvikalpananda took his seat on the small earthen platform lovingly crafted by his disciples. The cool river breeze, fragrant with herbs, carried the melodious chirping of birds. The rays of the rising sun formed a nimbus of light around him. He was enveloped by a cloak of devotion and wisdom. Looking fondly at the four sishyas seated before him, the sage commenced his discourse. 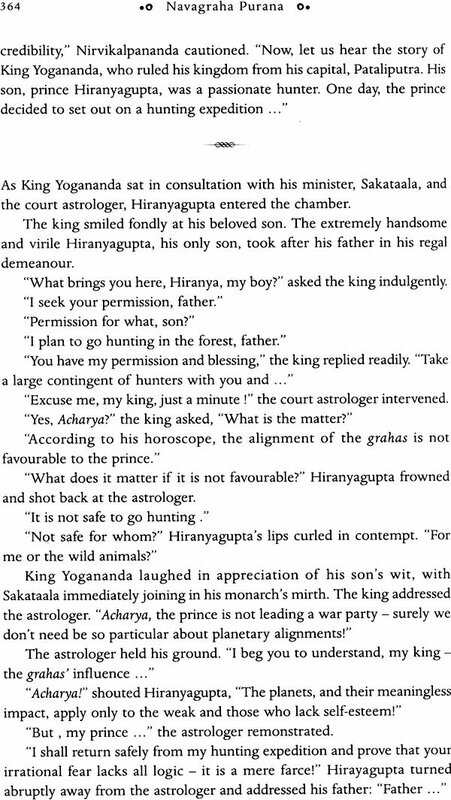 "I rejoice in your interest in the Navagrahas, my sons. The very intention of gaining knowledge, by paying heed to the spoken word, is commendable. The virtue of devotion can be attained through nine paths. When a devotee listens to words about God, sings his glory, or meditates on his mystical attributes, God blesses him with the quality of piety. God also gifts devotion to those who prostrate themselves at his holy feet, worship his divinity and exalt his greatness. Again, those who render God service celebrate his friendship or offer their souls to him are rewarded with a truly devout nature. Of these, listening to insights about God is considered to be the supreme path to devotion, as the word firmly directs the listener's mind towards the Divine." Nirvikalpananda continued, "It is but right that the stories of the Nine Planets be universally revered and propagated. 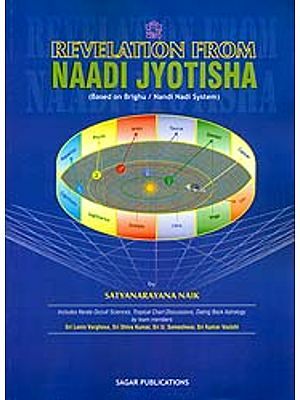 The enlightened assure us that hearing, or reading, these stories is tantamount to worshiping the Navagrahas themselves." Vimalananda humbly asked, "Guruji, does this mean that we are breaking our journey until you complete your sermon?" "Yes, my boy. Let us focus single-mindedly on this crucial narration." 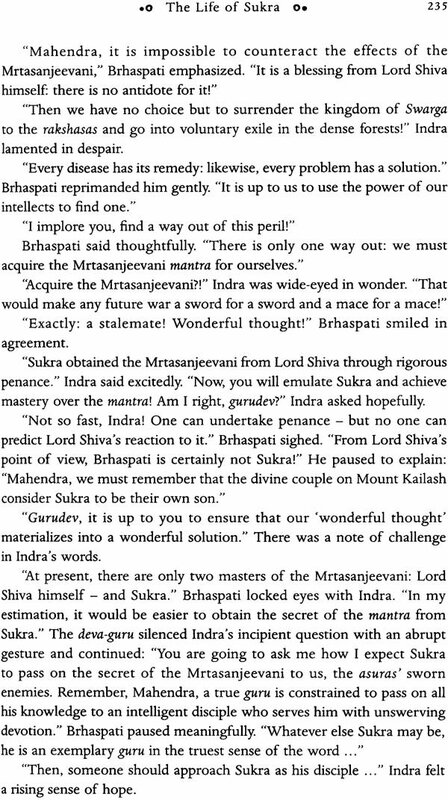 Sadananda piped up, "Master, I have a doubt." Vimalanda protested in mock horror: "Not again! It's a miracle that Sadananda's head remains whole on his shoulders - it is always filled to bursting with doubts!" The other pupils laughed in unison. 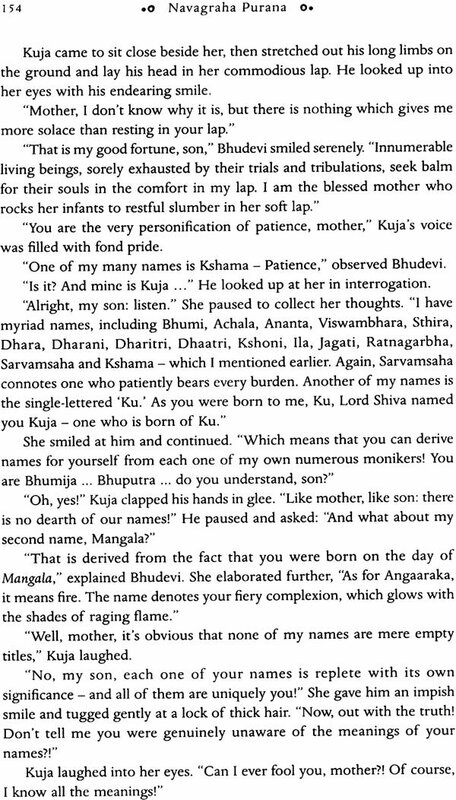 Nirvikalpananda smiled and gently rebuked them. "Doubt is but the intellectual striving for truth. It is the first step on the path to wisdom. 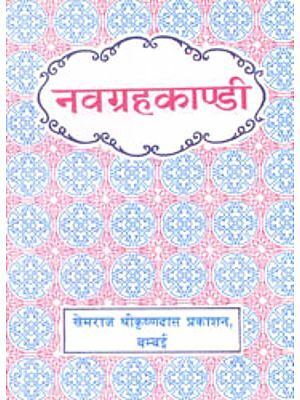 Prasnopashith, the question-and-answer method of oral instruction, is the best means of seeking and imparting knowledge." Turning to Sadananda, the sage gently asked, "What is your doubt, my boy?" "Good question, Sadananda. The Nine Planets are so powerful that people's devotion to them is tempered liberally with fear! 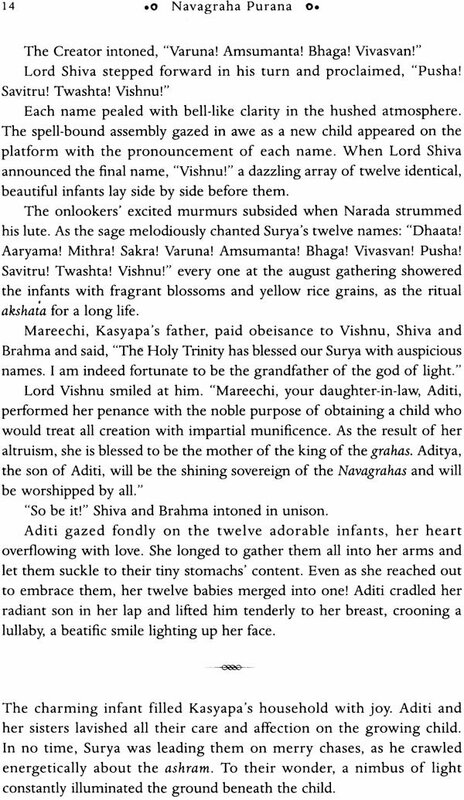 After all, the grahas rule all living beings from the moment they are conceived in their mother's womb to the instant they draw their last breath. It is the configuration of the planets at the moment of birth which dictates an individual's horoscope and ordains his future. The Navagrahas are the embodiment of the infinite cosmic energy which turns the wheel of life - the wheel of karma itself. These nine demigods, worshipped with hymns and prayers in countless temples, actually circumambulate the corona of the universe constantly, manipulating every life." The guru turned his solemn gaze on the upturned faces of his enthralled disciples. "The grahas define the boundaries of each life. Food, health, progeny, wealth, education, knowledge, glory - every single attribute of man is based upon the planets' unshakeable influence. They are the ultimate arbiters of a man's thought, speech, and deed. Their power over man and his destiny is set in stone." As the guru paused, Vimalananda interjected: "Master, in that case, if the planets do not favour." 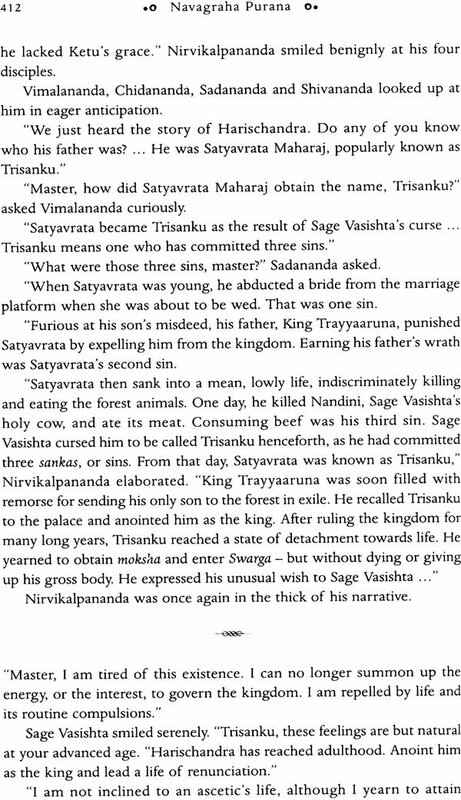 Nirvikalpananda silenced him with a gentle gesture. "I am coming to your point, Vimalananda." The sage continued, "Yes. If the planets condescend to look favorably on a man, his life will be filled with joy and harmony. If not, he becomes a storm-tossed boat, buffeted by inexorable waves of sorrow." The four disciples digested this in silence. Then, Chidananda asked, "Master, it is only human beings who come under the influence of the Nine Planets, right?" "Not only humans, Chidananda. Demons, deities - every living being in creation must bow to the fate ordained by the Navagrahas."